Biotechnology is one of the fastest growing industries in the world. Aging populations, chronic/lifestyle diseases, emerging-market expansion and technology advances are expected to continue to spur life sciences sector growth. It is becoming increasingly evident that the global biotechnology sector is operating in an era of significant transformation. Biotechnology is a growing industry in the United States offering excellent opportunities for rewarding careers. The job market is strong for students with a strong background in biological science and the people and management skills to become a leader. With its unique blend of science, medicine, business, and technology, the city of Pittsburgh has become a hotbed for biotechnology activity. Pittsburgh is home to Fortune 500 companies such as Bayer, medical device companies including Respironics, a growing number of thriving start-up companies, and incubators such as the Pittsburgh Central Keystone Innovation Zone, Urban Innovation21, and the Pittsburgh Life Sciences Greenhouse. Students in our Biotech program benefit from the strong area ties to the industry and have unparallelled access to networks and resources to help launch their careers, whether in industry or in research. In addition to Duquesne's role in the vibrant biotechnology industry in the Pittsburgh region, students in our biotechnology program differentiate themselves from students from similar programs through: A Unique Curriculum, Exceptional Access to Faculty, and State of the Art Research Facilities. Many graduate programs in biotechnology teach only analytical and laboratory techniques necessary for a career in academic research. Our program goes deeper - we provide advanced scientific training coupled with instruction in the management and team-building skills required by employers. 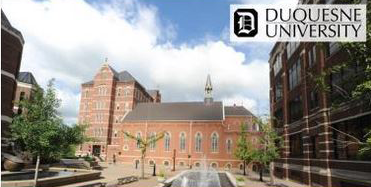 Graduates from Duquesne's MS in Biotechnology possess leadership, communication, ethics, and project management skills, as well as an understanding of the industrial environment and the process of product development. 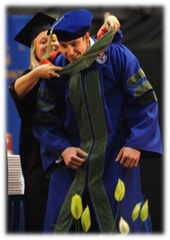 Our graduates have the skills to stand out as job candidates, in doctoral programs and in medical school. Students learn from faculty who are experts in their field and in the biomedical industry. The size of the program affords personal guidance. Faculty members take an active role in student mentoring and coaching. Additionally, through the Center for Biotechnology, students are encouraged to freely collaborate with faculty members, graduate students and undergraduate students in any of our nine schools and our biomedical engineering program. The Center brings together the various scientific disciplines to stimulate applied research and the translation of basic science into technology which can be turned into applications and products through technology transfer or entrepreneurial efforts. The Center for Biotechnology boasts modern laboratories, directed by nationally recognized research faculty associated with the Center. The research facilities are equipped with state-of-the art instrumentation comprising more than 15,000 square feet of combined laboratory space located on the Duquesne University Campus. Learn more about the center and its equipment. Students in the biotechnology program are well-prepared for R&D careers, and careers in industry. Students may also choose to further their studies in a medical school or a PhD program. Our graduates are trained to build on their science and to explore their opportunities. Alumni of the program work in laboratories, development, regulatory affairs, but are also finding rewarding careers in technical marketing and sales, either with multi-national corporations or emerging start-ups. Companies are eager to connect with our students. Students engage with Bayer School advisors and faculty for individual guidance through all phases of the job search process. Additionally, through organizations such as the Biotech Club, students learn about company interviewing techniques, networking and best practices to help them prepare to interview effectively. Visit the MS in Biotechnology website. Many of our graduate programs are still accepting applications for the Summer and Fall 2018 semesters. Visit our Programs and Certificates page for a complete listing of all graduate programs. If you are unsure if your program of interest is still accepting applications, feel free to contact the Office of Graduate Admissions and we will be happy to assist. Be sure to visit our archive of spotlight programs as well as our complete listing of graduate programs to learn more about our nationally regarded offerings.